simplicity and wants to have an “easy style” holiday. Nearby it's possible to find the 4 stars Flamingo Hotel, who shares the owners with the Mare Pineta, where the parents can look for pleasant moments in the Spa. Located in the south-west coast of Sardinia, in Santa Margherita di Pula, the Hotel Pineta Mare is one of the few 3 star hotels near the sea. The international airport of Cagliari-Elmas and the city center of Cagliari are about 40 Km from the Hotel. Mare Pineta takes the name from the beautiful pine forest in which it is immersed. In 2011 there where maid several renewal works. The atmosphere is informal and the private beach is just a few meters from the rooms. The hotel is 3 star, but can offer many additional services at the 4 star sister Hotel Flamingo, located a short walk through the pine wood (approx. 300 m). Completely renovated in 2011, the rooms are bathed in the cool shade of the pine forest. All with private entrance and equipped with many amenities. The Hotel Mare Pineta offers a convenient private beach with direct access. The Hotel offers its guests free umbrellas and lounge chairs. Guests can also make use of the beach facilities reserved for guests of the Hotel Flamingo, eg. the use of the card "Tessera Mare e Benessere" - sea and wellness card (which includes: sun bed rental, umbrella and beach towel at the beach of the Hotel Flamingo + entrance to the Wellness Center Ippocampo within the same Flamingo Hotel 4 stars, with the opportunity of using: sauna, turkish bath, emotional shower, heated pool with Jacuzzi). Cost of the Sea Card: € 60.00. The chance to use the services of the Wellness Center Ippocampo, inside the Hotel Flamingo, is one of the advantages of the guests of the Hotel Mare Pineta. At the Wellness Centre you can perform a variety of treatments, including: Kneipp, heated swimming pool, sauna, turkish bath, beauty treatments, different types of massage. Service available only during the high season. At the Hotel Flamingo, a fully equipped gym is available with a supplement for those who want to keep fit during the holidays. The lively entertainment program also provides for water aerobics classes, water polo in the pool, beach volleyball, soft aerobic. In the nearby and through selected partners are also available: diving, snorkeling, horseback riding, quad biking, mountain biking, golf at Is Molas Golf Club. Younger guests of the Hotel Mare Pineta can use the services of the Mini Club at the nearby Hotel Flamingo, available during peak season. In the Hotel, children can play and have fun, do different activities during the day (according to a schedule) and in the evening, dancing with the baby dance. The Mini Club is open for children aged 3 years. Service available only during the high season. For breakfast and dinner guests of the Hotel Mare Pineta can comfortably choose the internal restaurant, where you can taste delicious traditional regional dishes. Lunch is served at the sister Hotel Flamingo (approx. 300 m). The animation service (only during the high season) offers, in addition to sports activities, shows and group dances. The private swimming pool of the Hotel Mare Pineta, with sea view, is a convenient and relaxing substitute to the beach. Please note that pets are welcome at the Hotel (except in some common areas as the beach, the swimming pool and the restaurants). Tourist tax – The municipality of Pula requires the payment of a tourist tax of € 2,00 per person/overnight, to be paid on spot. 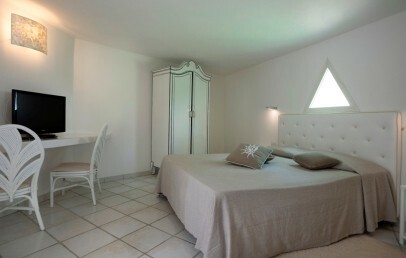 Double rooms located on the ground floor, surrounded by the fresh pinewood, can host up to 2 persons. They have all private entrance and they are furnished with a simple and comfortable style, with soft colours. The bathrooms are with shower, the rooms have a private patio and view over the garden. Family rooms composed by generally 2 separated rooms and located on the ground floor. They can host up to 4 people. 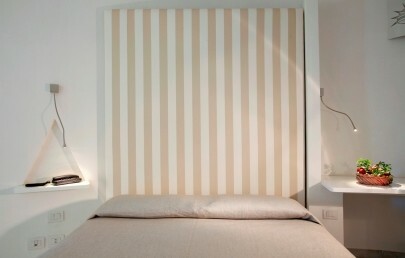 They have all private entrance and they are furnished with a simple and comfortable style, with soft colours. The bathrooms are with shower; the rooms have a private patio and view over the garden. Early Booking - Book within April 30th 2019 and get a 10% reduction (valid for stays from May 2nd to June 28th and from September 7th to October 6th)! Early Booking - Book within April 30th 2019 and get a 20% discount on your stay (valid for stays from June 29th to September 6th)! Early Booking - Book within May 31st 2019 and get a 15% reduction (valid for stays from June 29th to September 6th)!